Earlier this month, Ontario Genomics hosted the second annual Canada SynBio meeting in Toronto. The meeting brought together members of the Canadian and international synthetic biology community for a two day discussion of research, business and policy topics related to the rapidly developing field. The event expanded significantly upon last year’s successful conference (summarized here), with a variety of panel discussions, and a pitch competition from start ups. Several members of the SynBio Canada Steering Committee were able to attend. 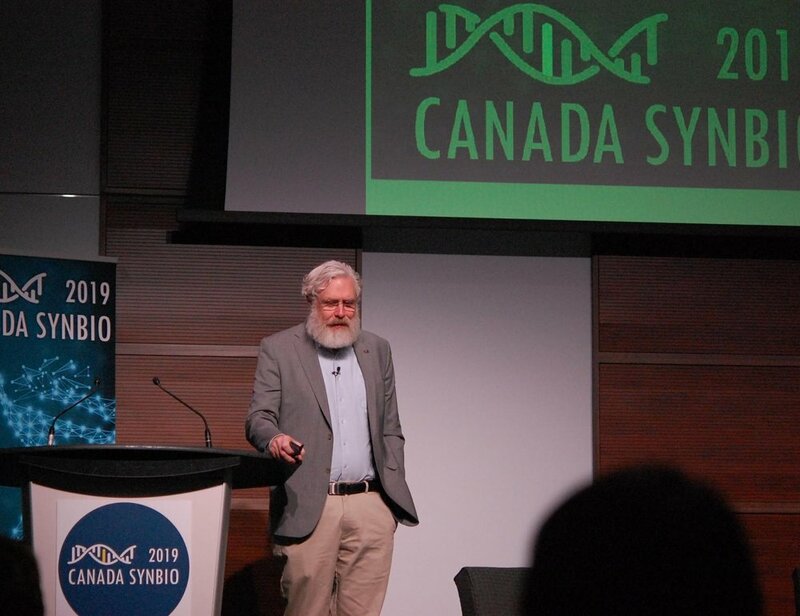 In this article, we summarize some of the discussions and presentations from the first day, highlighting some of the fantastic synbio research and companies in Canada and abroad. The first day began with a keynote talk by Professor George Church of Harvard University. He summarized the many recent advances in multiplex genome engineering that his research group has pioneered, including the editing of mammalian cells for virus resistance and in vivo lineage tracking. He also outlined the goals for Genome Project Write (GPW), the multi-national collaborative follow-up to the original Human Genome Project (HPG). The original HPG successfully sequenced a human genome in 2003, which led to rapid advances in efficiency and cost for DNA sequencing over the following decades. The new GPW, led by those like George Church, will attempt to synthetize a synthetic human genome (in cell lines) over the coming years. The GPW has several contributing members from Canadian institutions. Professor Church discussed the range of potential applications of DNA synthesis technology developed as part of GPW, including developing cryo-stable organs for transplant, investigating cancer and senescence resistance in model organisms as well as engineering viral resistance. When asked about the potential for misuse of these emerging technologies, Church emphasized the importance for surveillance and biocontainment, as opposed to moratoriums. He also pointed out that applications like human germline editing are not only ethically but also technically difficult, and the technology has many more immediate applications, like making organs more accessible for transplant. These immediate goals have fewer ethical concerns and can be accomplished in the short term with widely distributed benefits to society. The Human Health and Engineering Biology Panel featured discussion of novel health related engineering effort being developed by researchers in Canada. Laura Prochazka (University of Toronto) gave an overview of ongoing efforts to engineer more safe and efficient stem cell therapies using synthetic biology to guide cell specialization. Keith Pardee (University of Toronto), discussed his labs ongoing development of paper-based cell-free biosensors, which have been used to detect viruses like Zika and Ebola. He also outlined his work using synthetic biology to engineer biosensors and on-demand biomanufacturing to address global health and food security. Ubaka Ogbogu (University of Alberta) emphasized the need to pursue these novel therapeutic technologies guided by small “r” regulation, which focuses on proportional policies rather than outright moratoriums. Ogbogu also suggested the need for the community to plan synthetic biology ventures and outreach wisely, focusing on open communication and stewardship on behalf of those who cannot advocate concerns for themselves, as well as the importance of sharing technology and expertise with developing regions where some of the genetic resources have originated. The SynBio and Industrial Biotechnology panel saw discussion of the role of synthetic biology in manufacturing commercial products. Krishna Mahadevan (University of Toronto) discussed his group's ongoing work engineering bioprocess pipelines from end-to-end, pointing out Canada’s strength in raw materials. Pratish Gawand gave examples of how his company Ardra Bio is harnessing synthetic biology for the manufacturing of natural products for the cosmetic industry. 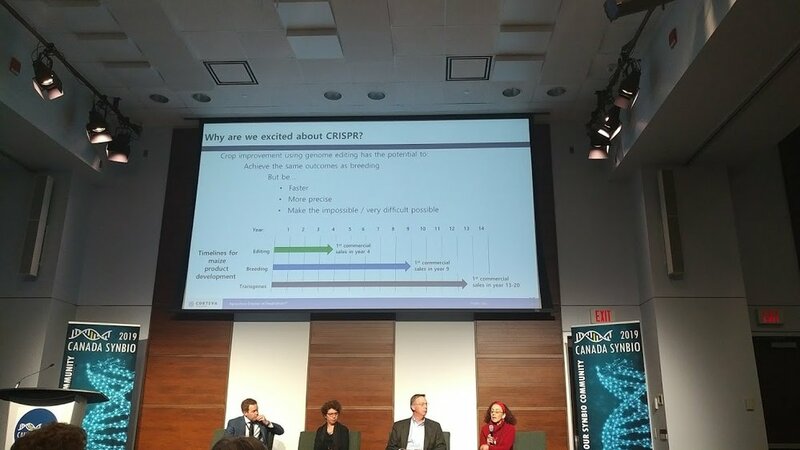 Sandy Marshall of Bioindustrial Innovation Canada warned that the petrochemical industry has a big head start on biology-based manufacturing with respect to bulk consumer ingredients and that it is very hard to convert biomass into bulk products at a competitive scale. Marshall suggested that high-value, more complex speciality products are a promising niche for synthetic biology-based approaches to add value. The Cannabis panel featured discussion of the potential role of synthetic biology in Canada’s emerging cannabis industry. Hyansynth CEO Kevin Chen discussed the need for a scale up in production of therapeutic cannabinoids in order to meet growing demand, highlighting the potential role of pathway engineering via synthetic biology. Hyasynth is also currently seeking to fill positions for CFO and Head of Research. Jess Leber of Ginkgo Bioworks discussed their collaboration with Canadian company Cronos Group for the production of cannabinoids, harnessing Ginkgo’s expertise in strain engineering. Leber pointed out that while Canadian marijuana growers may have an advantage in the short term due to differences in regulation, in the long run therapeutic and recreational production will likely rely on fermentation. Engineered strains can be used for production anywhere and can be tuned for a range of production goals. The general consensus of the panel pointed to a strong role for pathway engineering in cannabinoid production in the near future. The agricultural panel focused on the regulatory and social challenges faced by introducing genetically engineered organisms into food production. Clara Alarcon, Director of Molecular Engineering at Corteva Agriscience, noted regulatory obstacles, like decisions by European courts to group editing technologies like CRISPR in the same category as other GMO’s, are a major barrier to making use of new technologies. Alarcon pointed out that while CRISPR can precisely modify a single target, mutagenesis which introduces many more genetic alterations, is treated with much less scrutiny. Inconsistent and restrictive regulation are especially problematic at a time when climate change may threaten food security, and tools will be needed to adapt crops to variable growing conditions. Michael Lohuis, VP Genetics R&D at Semex, also indicated that fear among consumers is an issue the industry has still not effectively dealt with. This fear has created an environment where regulators and also competitors are each waiting for their counterparts to make the next move. There is a fear of ‘tarnishing the reputation of [something like] milk… nature's perfect food’, he said. Several panel participants noted the difficulty in changing public perception, especially as the value of improved farming practices are often lost on people living in urban areas, far from the farm. Small companies with limited PR budgets have a difficult time changing public opinion. Lohuis noted Semex has focused on transparency as well as engineering traits that consumers see the clear social benefit of, such as animal welfare, not just what's best for the company's bottom line. Emily Marden, of the Faculty of Law at UBC, noted that, in contrast to the previously discussed regulation, laws governing the ownership and benefit sharing for digital sequence information, which may be sourced from organisms in the developing world, is still lacking. She noted the ethical concerns going forward, as international regulation has not clarified exactly what responsibility genetic engineers using sequence information may owe to the originating regions from which they are taken. Marden suggested this benefit sharing does not necessarily need to be monetary, and could be provided through educational exchange or through job creation. She warned that it may be better for the industry to proactively address these issues before regulation makes them mandatory, as this establishes the positive uses of the technology and may convince the public of their value. Read more in Part 2!